Police stormed polling stations and repressed demonstrators during the referendum on Catalan independence. The referendum on Catalan Independence has gone ahead despite being declared illegal by the Spanish constitutional court in early September. 90% of those who faced repression from the Spanish State to vote supported independence. Prime Minister Mariano Rajoy said that the referendum vote is an “act of disobedience”, pledged to stop the vote. Yesterday, he sent national police to close polling stations throughout Catalonia. As the world watched, the police attacked voters in the streets and in polling places. Over 900 people were injured in the brutal attacks by police. Prior to the vote, the Catalan Parliament approved a legal framework for a transition to independence and a declaration now seems imminent. In the days leading up to the referendum, the chief prosecutor of the Spanish State presented criminal charges against members of the Catalan parliament and government for supporting independence. As a result, several MPs and senior members of the government were arrested. Over the last two weeks, Catalan students occupied colleges and universities and called rallies defending the right to vote. However, millions of ballot papers were confiscated by the Spanish government in a first attempt to stop the referendum. Yet, these hard-line tactics only increased the turnout and intensified the “independentista” feeling. 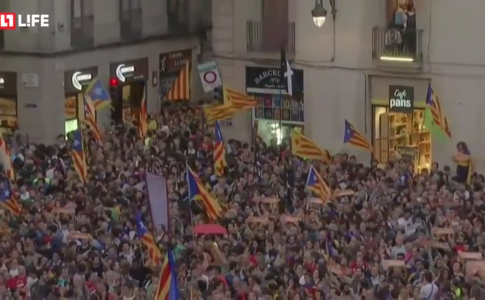 The referendum is taking place amid police violence against Catalanonians who gathered at the polling stations to exercise their right to decide the future of their region. Hundreds were injured as riot police stormed Catalan referendum polling stations. No one was safe from police batons [and the firing of rubber bullets] and online videos show the extent of the violent, often bloody encounters with the police. In its wake, hundreds of injuries were reported. According to the Spanish interior ministry, 336 voting centres out of more than 2,000 were closed by local and national police. Voting stopped at 8pm Spanish time. 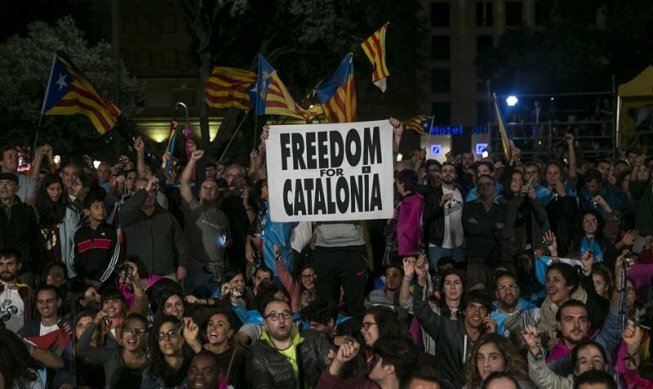 This sentiment was echoed by France’s Emmanuel Macron, who called Rajoy to express support for the “constitutional unity” of Spain– remaining silent about the brutal repression. Jordi Turull, the Catalan regional government spokesman, said that that 90% of the 2.26 million Catalans who voted on Sunday chose independence. These results do not include the ballots that were confiscated by Spanish police. According to Turull, 8% of voters rejected independence and the rest of the ballots were blank or void. Catalonia has 5.3 million registered voters. Major regional trade union:, the Intersindical Alternativa de Catalunya (IAC) representing education workers, the anarcho-syndicalist Confederación General del Trabajo (CGT), the pro-independence regional Coordinadora Obrera sindical (COS) and the historic anarchist Confederation Nacional del Trabajo CNT have called a general strike on October 3. The organization “Taula per la Democràcia”, which is made up of major trade unions in Catalonia also called for the general strike.